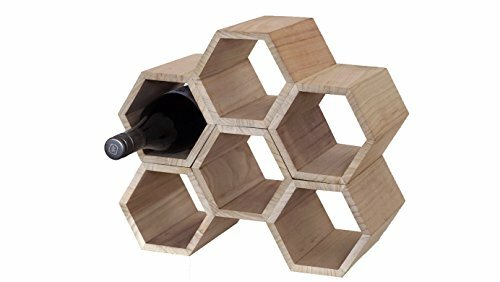 Made from 100% natural hard wood, this free standing honeycomb wine rack from Hive Originals is a customisable design which allows you to stack and reorganise to show off your wine collection in a variety of shapes. A sturdy and effective storage solution for 6 bottles, multiple hexagonal racks can be stacked together to make space for even more bottles and create even more elaborate designs. Requiring no construction and easy to clean and maintain this unique wine rack is the perfect gift for wine lovers or those looking to display their wine collection in an elegant, impressive way. No construction required. Comes as 2 pre-built stackable honeycomb shaped wooden pieces. The unique free standing design allows you to change the shape to fit any kitchen design or occasion; fits comfortably on a countertop or as a centrepiece when hosting and makes a great gift for wine lovers. Large storage shelves ensure that you can store large bottles of almost any size - including champagne and most spirit bottles. Hole size 14.17 x 7.5 x 7 inches. Stores up to 6 bottles per set. Stack multiple sets as you increase your wine collection. Constructed from robust hard wood and varnished to provide a fantastic looking wine rack that will last - no cheap plywood. If you have any questions about this product by Hive Originals, contact us by completing and submitting the form below. If you are looking for a specif part number, please include it with your message.